Amazing......just what I wanted! I have been looking for a durable, good looking jacket for some time. I especially like the fact that it has an inside liner that zips out. This coat is good for nearly all seasons! 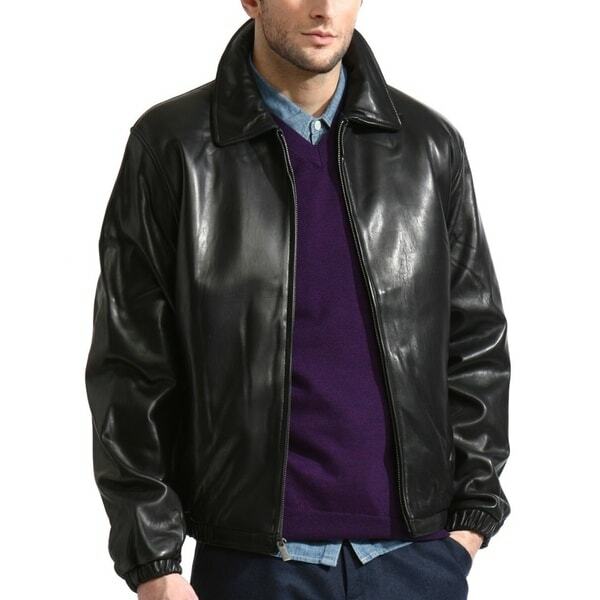 A classic leather bomber crafted from the highest quality top grain, New Zealand lambskin leather. This translates to butter soft as it is 100% full grain semi-naked lambskin. An essential piece of outerwear that looks great worn casually or dressed up. It's an easy bomber style that has elasticized cuffs for comfort and ease to wear. Who wants to deal with snaps when it's cold out! Fully lined and medium weight with front-zip closure. Two front pockets with interior breast pocket. A perfect gift for your loved one or simply gift yourself! I love my jacket!!! The feel and quality for the price is a great deal. Husband loved this jacket. Good fit and soft. Likes that the wind cannot blow up under jacket or through sleeve cuffs. great service!! very soft-good fit-quality product. I would recommend this product to anybody who asks. very happy!! Classy, buttersoft, perfect retro vibe!